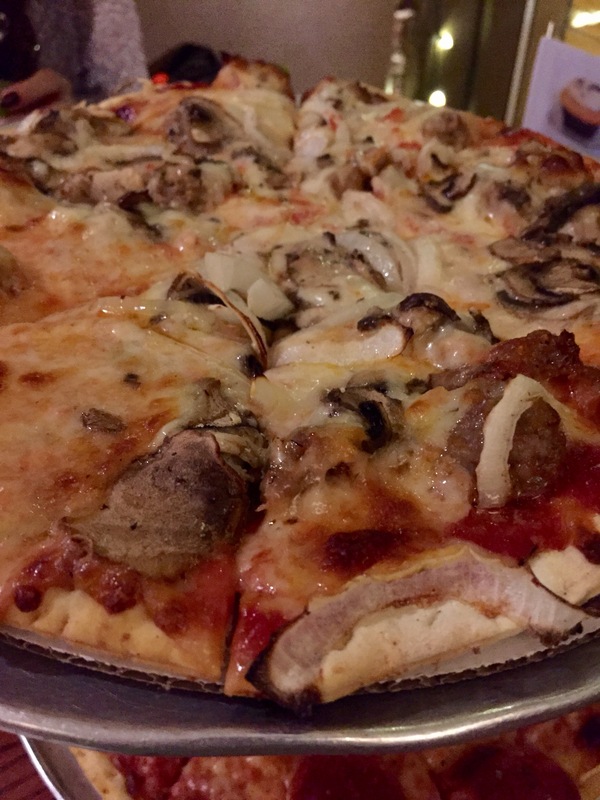 Living in or near Kenosha is like hitting the pizza lottery. 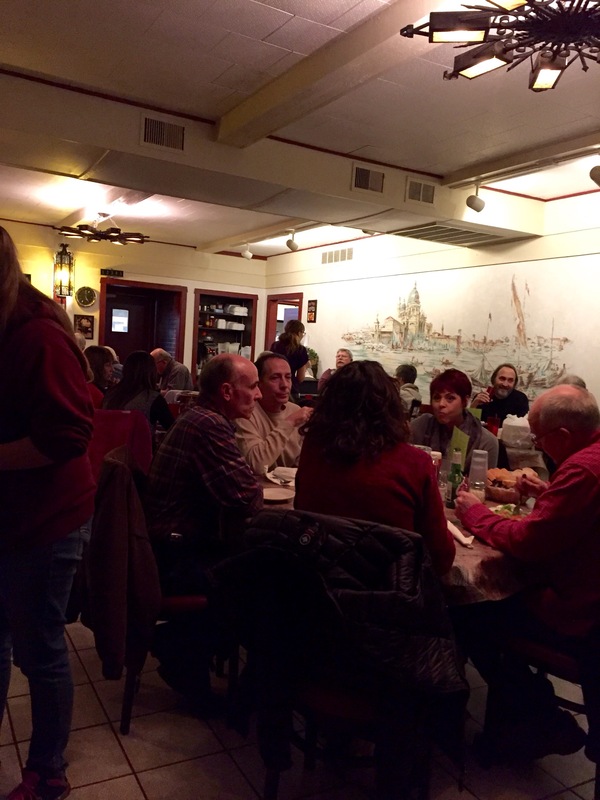 Like kringle in Racine or bars in Cudahy, there seems to be an Italian restaurant on every corner in Kenosha – and everyone has their favorite they swear is the BEST. 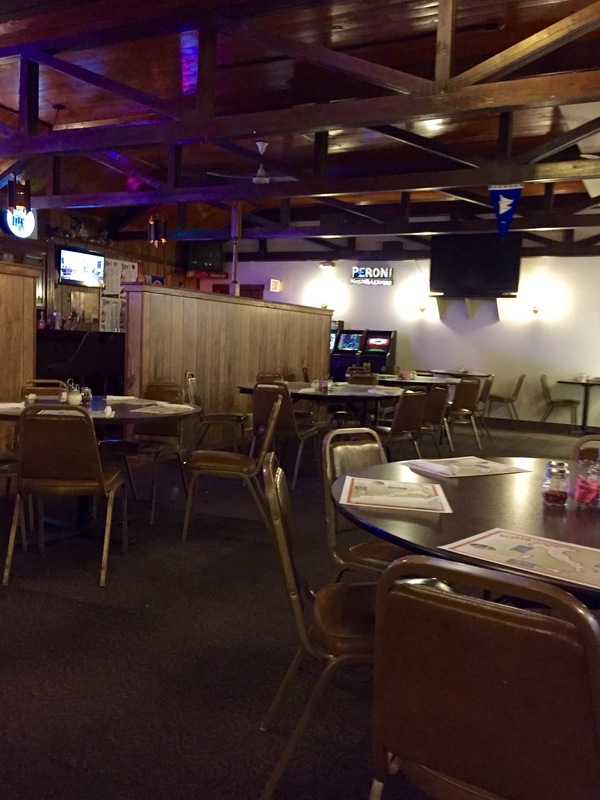 The interior can probably best be described as… dated. One big, open room with tables varying in size. 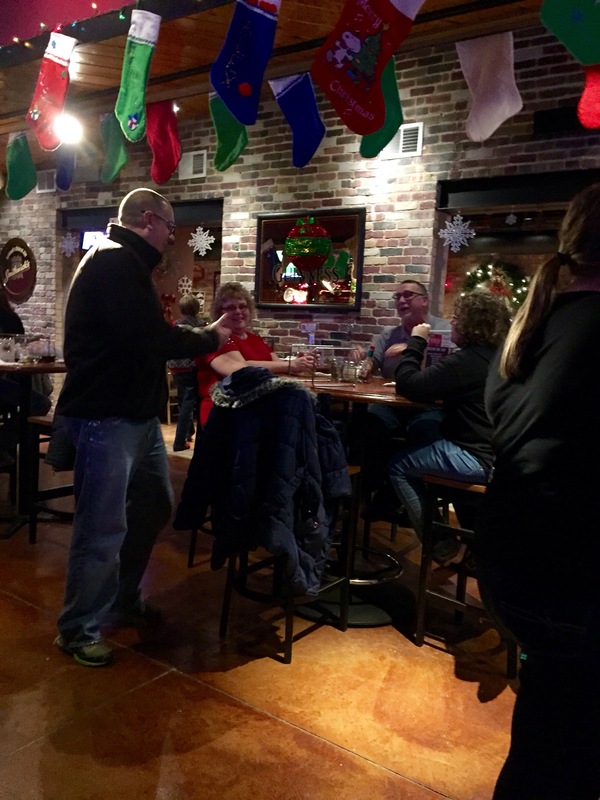 The full bar is a plus – I occasionally like to have an adult beverage with my pizza. The pepperoni and cheese pizza (small, $11.18) was fair. 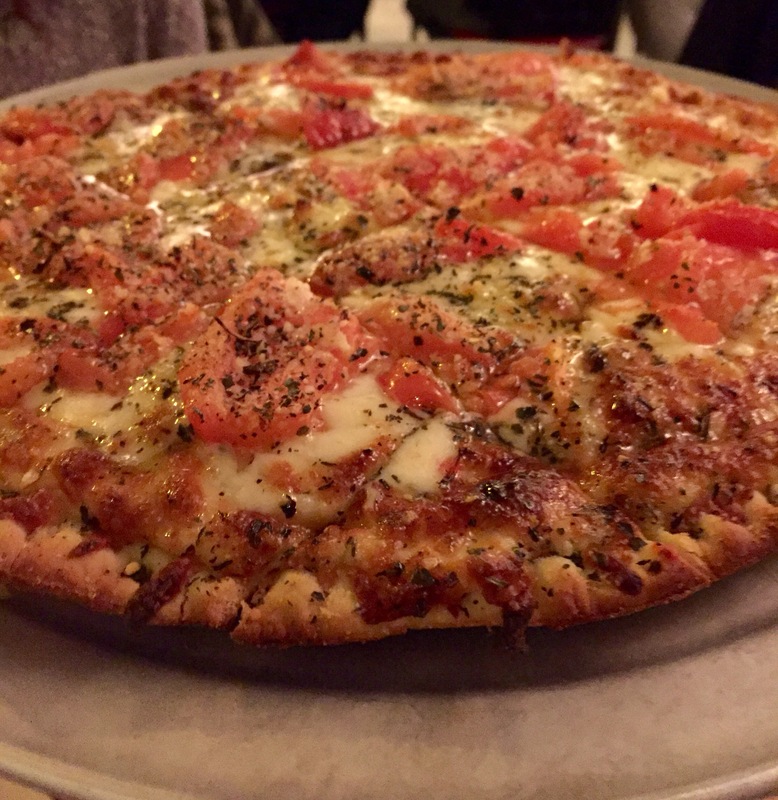 The thin crust was crispy, thumbs up. But the sauce was thick, almost paste-like, and applied very sparingly. I also would’ve like a little more cheese. 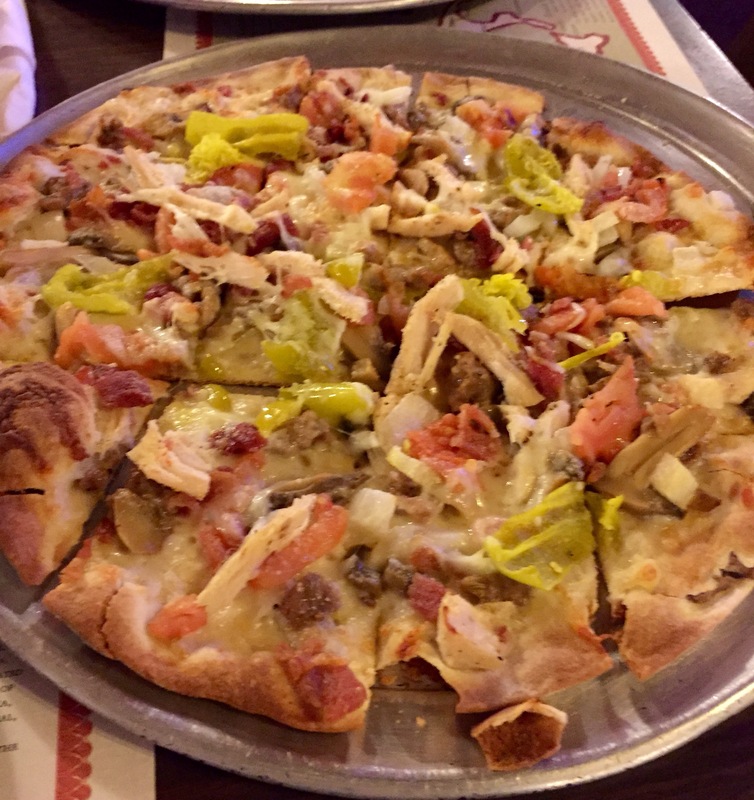 The specialty pizza we chose was Giuliana’s Special (small, $13.99) – the extra-thin crust was extra crisp and sauceless and topped with mozzarella, mushrooms, onions, tomatoes, sausage, chicken, bacon and pepperocinis. That sounds overwhelming, but it was really quite balanced and good. And I liked the little bit of heat the pepperocinis added. 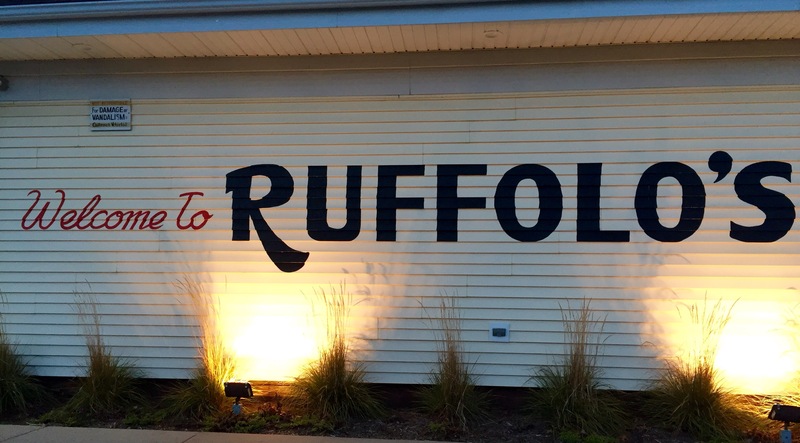 FYI – Ruffalo’s does have gluten free options, including pizzas. The first thing I notice about the pepperoni and cheese pizza (small, $9), is that it’s cut in triangles as opposed to squares. This could very well be my OCD speaking but, I like my restaurant pizzza cut in squares. Triangles are for the frozen cardboard pizzas. 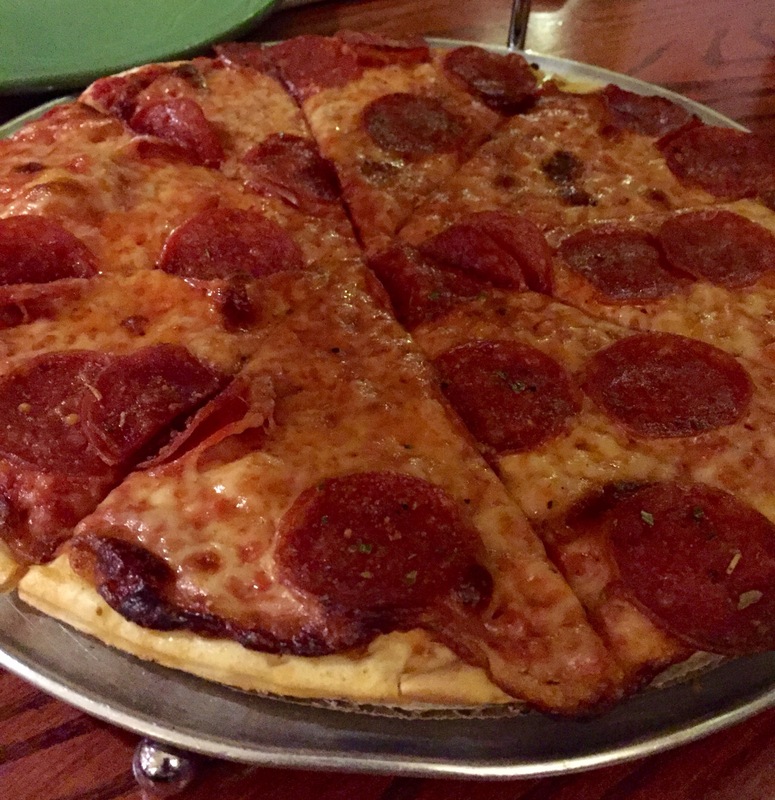 Anyway, back to tasting… Everything about the pepperoni and cheese pizza at Kaiser’s was good. 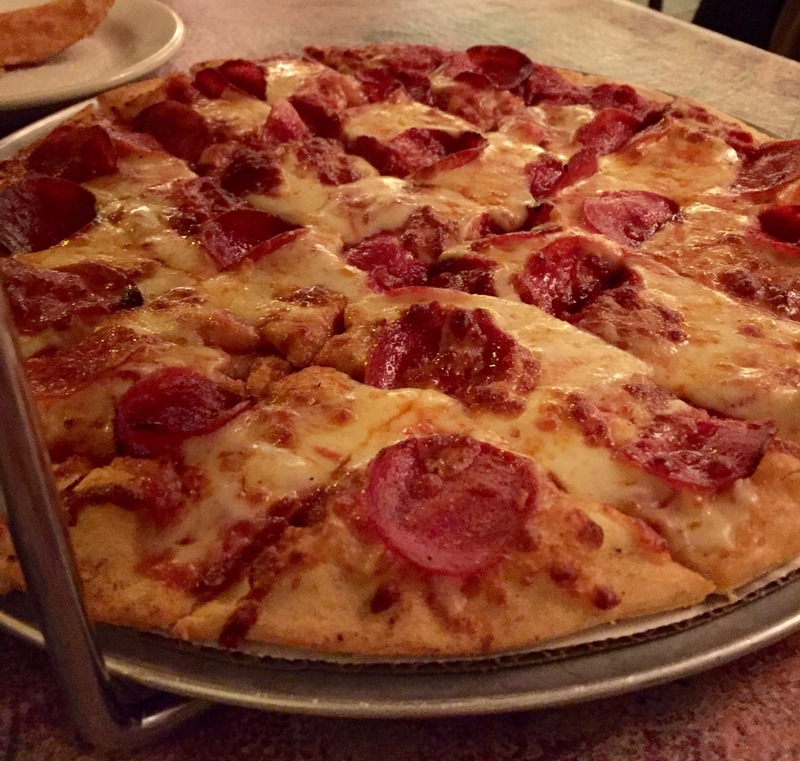 Crust – crunchy. Sauce – decent. Cheese – plentiful. Overall, we all enjoyed it. 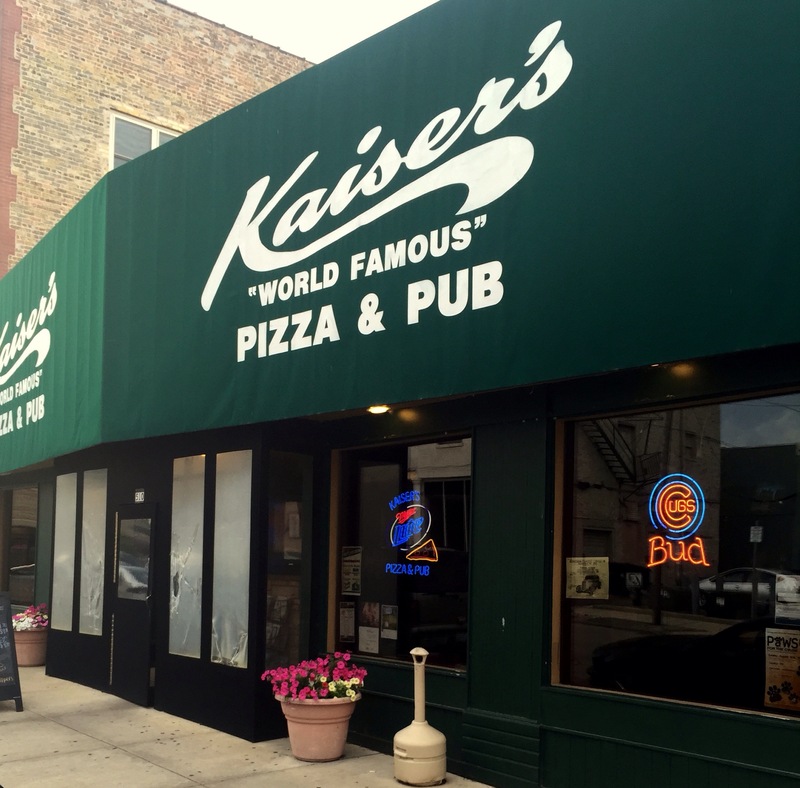 We selected Kaiser’s Special (small, $12) for the specialty pizza. And once again, this pizza topped with cheese, sausage, mushroom, onion and green pepper was good. No doubt that we’ll be back again and again for more. Gluten free pizzas and pastas are options, as well. The cozy atmosphere was great. And this placed was PACKED by 5pm on a Saturday night. Luigi’s cheese and pepperoni pizza (small, $8.50) was phenomenal. The crust was light and crunchy. The sauce had just the right amount of seasoning. And the cheese… the cheese was piled on to create a melty, gooey taste of heaven (yes, I’m a Wisconsin girl… Why do you ask??). The margherita specialty pizza (small, $10.25) was my favorite out of the 6 pizzas that were tried. Cracker thin crust covered in garlic olive oil, topped with tomato, plenty of mozzarella and basil. My idea of pizza perfection. And did I taste a hint of smoke in both pizzas? Does anyone know if Luigi’s uses a wood oven? 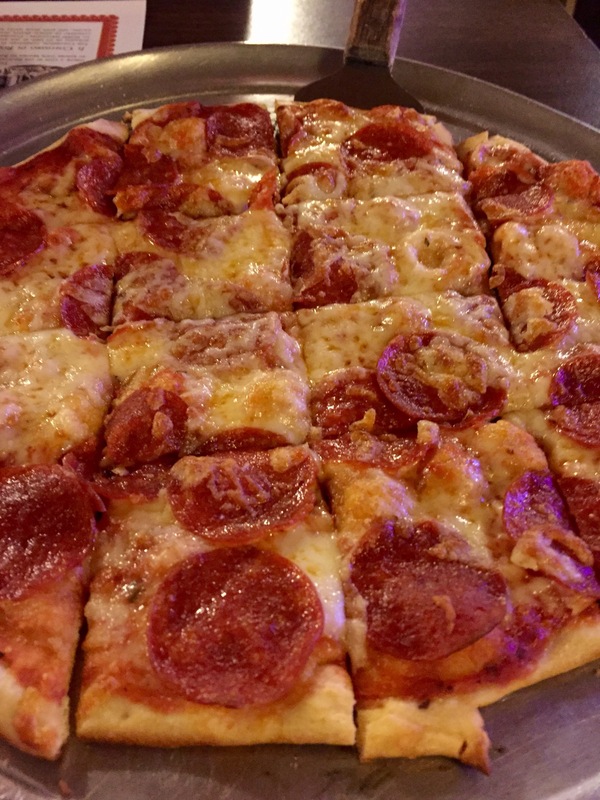 I’m of the opinion that there is no such thing as bad pizza, but I’d move mountains for really good pizza. 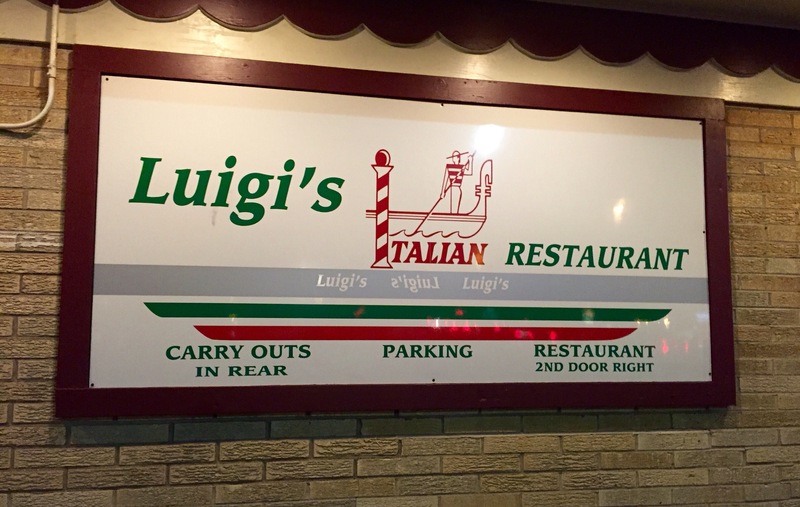 I would recommend any of these locations, but Luigi’s won the battle on this night.